In order to create an exercise, we need to know a) what joint(s) are in motion, b) what muscles are attached to those joint(s) and c) where the load is coming from (direction). To begin the exercise, the spine should be in a neutral position: Chest up and open, upper back muscles tight, abdominal muscles pulling in, navel to spine. For the Hip Extension (or as some call it: Stiff Legged Deadlift), most of the movement comes from the hip joint, with a very small bend at the knee, as the hip joint flexes, forward. If you are moving from the spine, the exercise is incorrect, because the goal of this exercise is to work the glutes and hamstrings. It can also be dangerous to “hunch” or move from the spine. There is the potential to strain the muscles of the lumbar spine or herniate a disc, in that area. In addition, avoid hyper-extending the cervical spine (neck). Stay in the “neutral spine” position, even when you are in the bottom position (horizontal plane). As you extend at the hip joint, you are pulling yourself upright by contracting the hamstrings and glutes. The hip is a hinge joint. Avoid rounding the lumbar spine and keep the abdominal muscles tight, as you straighten at the hip. Keep the glutes engaged and avoid relaxing the upper back or abdominal muscles at the top of the movement. Other variations include; using a low cable, dumb bells, a hip extension bench. 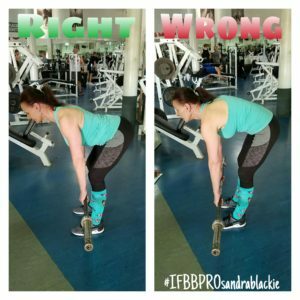 Sandra Blackie is passionate about helping men and women reach their personal health and fitness goals – no matter what they are. With a focus on communication, continuous improvement and excellent service, Sandra brings her knowledge and expertise to the table to deliver high quality, unparalleled results. Copyright © 2019 Sandra Blackie’s Freedom of Fitness. All rights reserved.